Jungle Red Writers: True Crime Tuesday - How well do we really know our neighbors? True Crime Tuesday - How well do we really know our neighbors? How well do we really know our neighbors? ROSEMARY: How well do we really know our neighbors is the tagline for my latest book. DEAD HEAD tells the story of a woman who learns that one of her friends is actually a fugitive from the law. Recently I had my own How well...moment when I learned something frightening about one of my neighbors. About a year and a half ago, my husband and I read a horrific story in our local paper. Before the day was out, the news had spread all over the country and within a week the world. 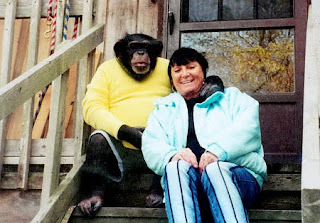 While visiting a friend at her Stamford, Connecticut home, a woman was viciously attacked by the friend's pet, a 200+ pound chimp named Travis. Our first thoughts? OMG, that's the chimp we met. As far as we know, none of our other neighbors owns exotic pets, although how would we know unless something awful happened? This one we knew about. A few years earlier Bruce, who is a runner, was followed home by a medium-sized black dog. A friendly pooch, no amount of shooing impressed the animal that he wasn't already home as he sat on our back deck waiting to be fed. We called the number written with a Sharpie on the dog's collar. "Can you bring him home?" the woman said. Now...if my dog had run off, I'd have been there in a shot to scold, forgive, and rescue the doggie. But this woman sounded a little odd and we thought perhaps she was an invalid, so we hustled the dog into our Jeep and drove to her home. Home is a bit of a euphemism. Unless stately Wayne Manor was somewhere out of sight (entirely possible) home consisted of a few trailers circled like wagons around a campfire. With lawn chairs in the middle. It reminded me of pictures I'd seen of travellers camps in Ireland or the gypsies in old werewolf movies. The dog leapt out of the car and we were greeted by a short, dark-haired woman - trailed by a short, dark-haired chimp. I think we sat for a few minutes as she thanked us for returning her pooch, but I have to say, I was freaked out by the chimp. I've been on safari when lions paced around our Land Rover, I've seen rattlesnakes and bears on hikes and I've heard hyenas while sleeping in a tent on the Masai Mara. I don't scare easy, but the idea of a chimp walking around a suburban backyard, albeit a strange one, was weird. We left in a hurry. Many people feel that someone should be accountable. But who? The chimp's owner has recently died. I understand the victim's family is suing the state. Bruce thinks I should write about it, that it would be a "big" subject, but I'm not sure. Certainly people are killed in our books all the time, but this feels different. Perhaps because the victim miraculously survived the attack. (Yes, I have seen her on Oprah and her spirit is amazing. )Perhaps because - thus far - I have had a lot of humor in my books and I can't see how I can have anyone cracking wise in a book where something like this happens. Although they occasionally do when someone gets bumped off. What do you JRs think? RHYS: I think people who keep exotic pets are asking for trouble. Suing the state? Because she was clueless? To me this smacks of the burglar who fell through a skylight and then (successfully) sued the family who lived in the house, or the boys who set fire to someone's car in their driveway and then were burned and sued the car's owners. We have gone litigation crazy and it has to be stopped. This is probably why I write crime novels. The crimes we write about make sense. They are true cases of good versus evil, not the random violence of the real world. That's what I think is so intriguing about True Crime Tuesday. It's very different, writing about crime, no matter how grisly, when it's not real. But should it be? And I think we DO write about the random violence of the real world. As I reporter,I do it every day. As a novelist, I try to keep that reality--that "real" people are involved. Our fictional extra power is to make sure there's justice in the end. In some way.